Frederick Frank Fred Zabel, 93, of Atchison, died on Wednesday, April 10, 2019, at the Atchison Senior Village. Mass of Christian Burial will be 2 p.m. on Monday, April 15, at St. Benedicts Church with Fr. Jeremy Heppler OSB, as Celebrant. Burial will follow in the Mt. Calvary Cemetery, Atchison. A parish rosary will be recited at 2 p.m. on Sunday, April 14, with visitation to follow until 4 p.m. at the Becker-Dyer-Stanton Funeral Home. Memorial contributions are suggested to St. Benedicts Abbey or the Benedictine Sisters and may be sent in care of the funeral home. Fred was born on April 1, 1926, in Atchison, the son of Frank and Marie (Rohleder) Zabel. He graduated from Atchison High School in 1944. Fred served during World War II in the United States Air Force. 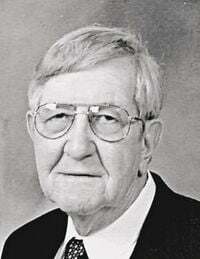 He worked starting as a lineman for Southwestern Bell and retired as a wire chief for AT &T Telephone Company in 1985 after 39 years of service. He was a member of the St. Benedicts Church, member of the V.F.W. and American Legion Posts, Atchison and the Pioneers. Fred enjoyed bowling, yard work, flowers, woodworking and especially watching the Royals and Chiefs. He was married to Marcelline Jean Compton on June 8, 1948, at Sacred Heart Church. She preceded him in death on July 16, 2009. Survivors include: two daughters, Barbara (Leonard) Hundley, Atchison, and Jacqueline (Gary) Pauley, Smithville, Missouri; a granddaughter, Nicole (Paul) Howard, and great-granddaughter, Emily Howard. His parents; wife, Marcelline, a brother, William Zabel; and sister, Henrietta Stucker preceded him in death. As published in the Atchison Globe.